Can a headset make a bike faster? Can the buzz of a hub amplify the pleasure of freewheeling down a mountain? When the company bringing the components to life is Chris King, the chances are, yes! To most cyclist, Chris King is royalty, the type of company a rider automatically adorns their bike with. The type of company that creates excitement with every move they make! Without surprise, a good amount of excitement came over us when we found out Chris King was releasing two new colors, matte tortoise and matte mango. 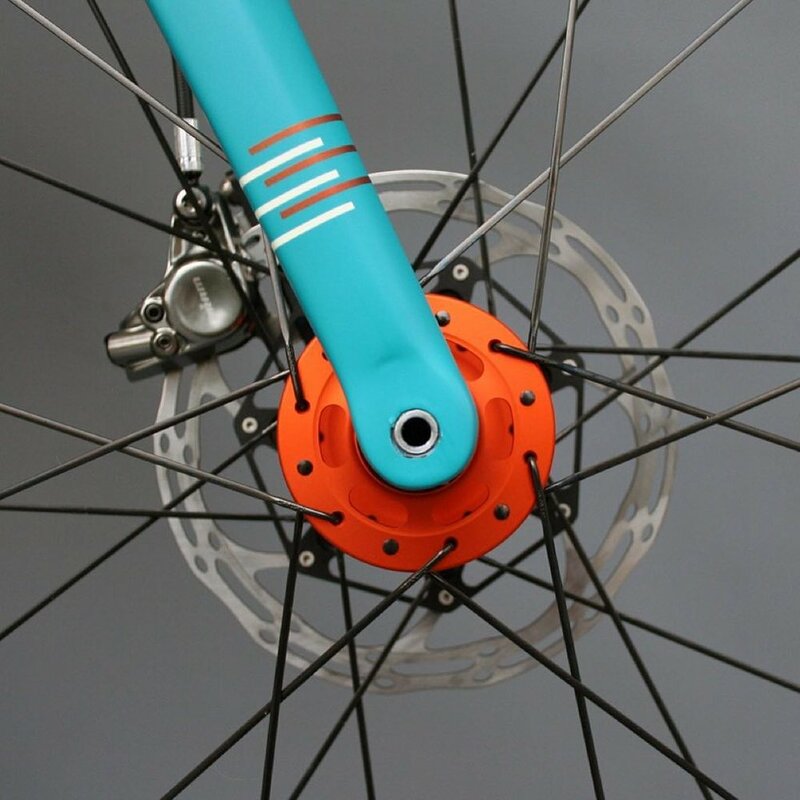 Two perfect new colors to bring life and excitement into future bike builds. Our excitement soon boiled over when we received a call from Rob English asking us to create the paint design for a dream bike build that would be a part of the Chris King launch party for their two new colors. “Can you build a bike around some fresh Chris King parts in matte mango?”, yes we can, with pleasure! Off to the sketchbooks we went! The design had to be fun and colorful yet needed a sense of order as to not take away from the Chris King components going on the frame. Should we create a pattern for the design? Maybe some bold color blocking would do the trick! As we played with various concepts we kept coming back to the thought of fun! As a company Chris King is both extremely precise and yet extremely fun. It really is hard to look at a bike with a colorful King headset installed and not think of the build as fun. So it was decided, we had to design the bike around both being fun and being precise! Now we just had to figure out how to do that on a bicycle! The first concepts played with two colors being pulled away from each other in an uniformed fashion, a good start but we needed more fun! As we played with more ideas the idea of playing with splattered paint came to mind, can we add order to some Jackson Pollock action? Upon looking at some images of Pollock’s paintings hanging against a clean white wall the answer soon became clear, this was the direction we wanted to head down. Luckily for us the eventual owner of the bike was very open to letting us play with the concept and so we did. Getting the paint splatter just right was critical in the design phase, too tight and it would look busy too loose and it would look like overspray. In the end our painter was able to come up with the perfect splatter, just enough funk to make the bike stand out without making it look chaotic. For the paint breaks we cut the paint in different areas on the top tube and the down tube to keep the paint scheme a bit more organic. We also added alternating paint lines at the paint break to ease the transition of chaos and order, it also gave us some cool lines to play with throughout the paint job. Elegant distortion is certainly a concept we will continue to explore and expand on. Plus, at least one of us here at the studio will be taking this paint scheme onto their personal bike…Wait to find out who!